At 10 o’clock this morning, there was a line of HGV lorries backed up along Royal Albert Way, unable to enter the ExCeL Centre. After reading a ‘Litany of Resistance’, a group of people dashed into the road, stopping equipment that was en route to the DSEI arms fair from reaching its destination. Beyond just blocking the road, activists even managed to chase a truck carrying the Thales Bushmaster, used in Iraq and Afghanistan, sold to the shady Indonesian Special Forces, and currently being marketed to human rights abusing Libya, back down the road away from the arms fair! After a circle of prayers, the Quakers held a meeting for worship, while continuing to block the road. Later in the day, the Catholic Workers held a moving funeral service in memory of the the victims of conflict and the arms trade. ‘Blood’ was spilled across the road, and people sung hymns while gathered around a white coffin. 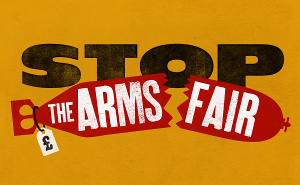 It was a powerful and exciting day of action against the arms fair, which brought together many faith groups including Put Down the Sword, the Quakers, Catholic Workers, Student Christian Movement, Pax Christi and more! Get down to the ExCeL Centre tomorrow to call for #WindNotWeapons as part of the climate day of action.